Traditional mehndi designs are always all time favorites. But if this designs are enhanced with modern styles then it will look more magnificent. Here we have presented such style that has also have traditional touch as well as it is blended with new style of Shading. These designs need practice and patience to have perfection. Once the simple designs are mastered then it becomes easier to expertise for delicate and minute designs. Many techniques are used for shading. Such as clusters of circles, giving rough strokes through thick henna border, scribbling with henna cone, by giving swirls patterns or by dabbing a cotton dipped in henna solutions and applying evenly in designs. We have explained these techniques on our website page. Also have a look at our mehndi designs Video page which has many videos displaying these shading techniques as well as many shading designs presented. 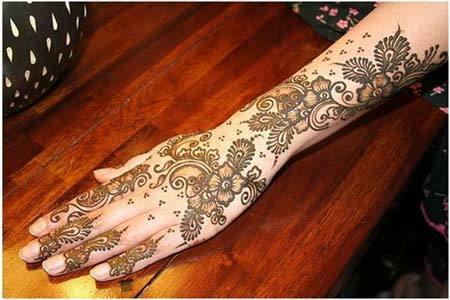 As stated, these designs can be used in bridal mehndi designs, Arabic mehndi designs, Indian mehndi designs like Rajasthani mehndi designs. Shaded mehndi designs can also be combined with glitters, shimmers or crystals. We have exhibited only few of the shaded mehndi designs here. To have a look at variety of such designs, do browse through our shaded mehndi patterns of our Website. Get free download of most popular mehndi designs videos from our Video section.